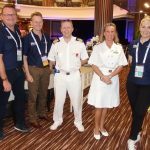 Three Carnival Australia cruise ships are this week contributing to Papua New Guinea’s successful hosting of the APEC 2018 Summit in the Port Moresby national capital. In what is being seen as ‘a natural extension’ of the cruise tourism relationship developed in PNG in recent years, the three ships — P&O Cruises’ Pacific Jewel and Pacific Explorer and Princess Cruises’ Sea Princess — are providing additional accommodation and conference capacity. Having the three ships berthed in Port Moresby’s Fairfax Harbour for APEC highlighted Carnival Australia’s pathfinding role in the resurgence of PNG cruise itineraries in recent years and the contribution to the visitor economy. At a time when a large proportion of international visitors to PNG arrive by cruise ship, ships from six Carnival Australia-brands – P&O Cruises Australia, Princess Cruises, Holland America Line, Cunard, P&O Cruises World Cruising and Seabourn – call at PNG destinations. In the three years from 2016 to 2018, Carnival Australia-brand ships made more than 250 port calls in PNG accounting for nearly 400,000 passengers. These were among the 1.3 million passengers who travelled to the Pacific Islands as a whole on Carnival Australia ships. 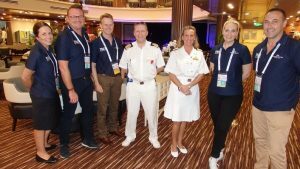 P&O Cruises Australia, renowned as Australia’s homegrown cruise line, which has been cruising to the South Pacific for more than 85 years, accounted for half of the passengers who visited Papua New Guinea on Carnival Australia ships during the three-year period. The cruise line also led the revival of cruising to PNG when Pacific Dawn sailed to the Trobriand Islands in the Milne Bay district in 2013. In recent years, the beautifully remote Conflict Islands were added to P&O’s popular PNG itineraries. “Our support during APEC is much more than a one-off event and highlights the depth of our connections with the people of Papua New Guinea,” said Carnival Australia Chairman Ann Sherry, who will be visiting Port Moresby to participate in the APEC CEO Summit being held onboard Pacific Explorer. “Basing the three ships in Port Moresby is a natural extension of the relationship established through the contribution of cruise tourism. In another sign of Carnival Australia’s bond with PNG communities, the P&O Pacific Partnership, to which P&O guests contribute, is currently supporting two local Save the Children Australia programs.